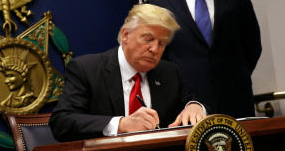 The rogue ruling by a federal judge in Hawaii Wednesday, March 15 imposing a temporary restraining order aimed at interfering with an Executive Order calling for the vetting of travelers from six failed countries, notorious for jihadist activity, hours before it was set to go into effect; is malicious judicial malfeasance, that shamelessly contravenes the President’s constitutional authority. In a decision published the following morning another obstructionist federal judge in Maryland specifically blocked the 90-day ban on immigration for nationals of six failed state countries. Both of these rulings would not prevail against an appeal, but they knew that already when they did it. These judges at the behest of their handlers are playing politics in violation of their oath. Political lawfare is now the Democrat’s weapon of choice in an attempt to undermine the Presidency of Donald J. Trump in the hopes of engineering a constitutional crisis, ensnaring his Administration into the appearance of infracting the law, and satiate their salivating globalist cabal hunger for a soft coup to remove him. Their collusion in fabricating these rulings are scurrilous. You dear reader are not required to be legal scholars, constitutional professors or possess a law degree to understand that you are the target these propagandist are trying to hoodwink. All you need is a dictionary to understand words of the English language written in the constitution that grant the Executive Branch foreign policy and national security authority, not the judiciary. Ask your politicians who caused free American citizens to become subjected to the humiliation of an electronic stripsearch and 4th Amendment violation of our rights in order to get onto an airplane and travel anywhere? Why do we now have imposed on us one of the most intrusive surveillance laws against free American citizens ever passed in our history called the “Patriot Act”? Against whom have our military service men and women been at war, being killed and maimed in Iraq, Afghanistan, and around the world for over 15 years now, and likely 15 more? What is the name of the common motive that inspires terrorist groups, declared enemies of the United States we know as; Al Qaeda, ISIS, Boko-Haram, Abu Sayaf, Al-Nusra, etc..? The honest answer to these questions are radical Islamic terrorist who consider themselves “jihadist.” To be clear, not all Muslims are Jihadist. Of a certainty, all Jihadist are Muslims. It is the responsibility of the President of the United States to honestly convey to the American people the name and nature of any enemy waging war to enslave free people. It is the job of the President to defend against it by using the powers granted to the office by the U.S. Constitution and U.S. Congress. This is why President Trump’s anti-jihadist immigration travel ban is a rational and lawful Executive Order. Those who impede it either have a diabolical agenda or political motivation that puts in jeopardy American lives to callously advance it. The founding revolutionaries empowered the President with the same parental logic your parents gave you and you as parents instruct your family in order to protect them and secure your home. Lock the door and do not open the door up to strangers. Would you allow anyone to trash your house rules, then order your kids to ignore your parental authority, unlock the door, and let in anybody who wants to come in, while you just helplessly stand by and do nothing about it? No responsible parent would permit that. No responsible president should either. President Trump got it right. We are prudent to support his efforts.